We have been discussing the planning the way business is done using the worlds best ERP SAP.This post is a continuation of previous post of the blog. 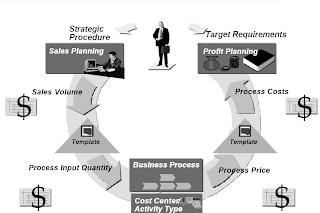 Allocations from processes to cost objects may be done using distribution, assessment and activity allocation. These techniques have long been available in R/3 and are not new to ABC.In addition to these methods, the template is a new allocation tool. The new tool provides a more general capability than the other methods since it includes the use of formulas and functions.The use of templates results in a quantity and value flow. 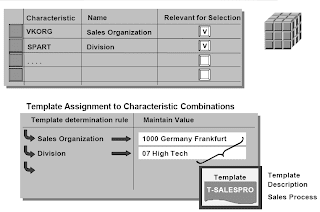 The link connecting the template to the cost object is created through a template assignment function in customizing.The template is assigned to a combination of overhead key and costing sheet.The costing sheet is linked to a valuation variant, which is linked to a costing variant, which is linked to the order type.The overhead group is material master data. The overhead group is assigned to an overhead key in customizing.For overhead that will not be modeled using business processes, the surcharge method of overhead application is still available. 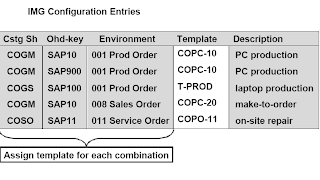 The costing sheet and overhead key assigned may be seen in the order master data control data screen. 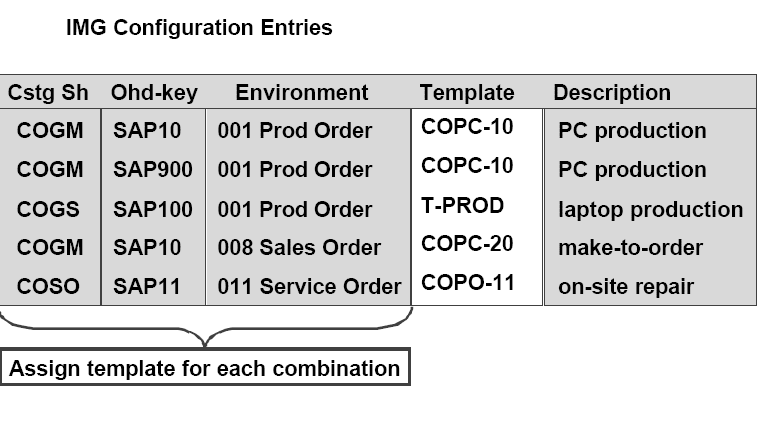 The same template is used for all objects using the same costing sheet and having the same overhead key within the same environment.This means that a template may be designed to apply to hundreds or thousands of cost objects.Basic environments are: 001 cost estimate/production orders; 002 reference and simulation costing;003 cost estimate without quantity structure; 004 network; 005 WBS element; 006 general cost objects; 007 internal order; 008 sales order; 010 product cost collector; 011 service order; SBP structured business process, and PAC costing-based profitability analysis. 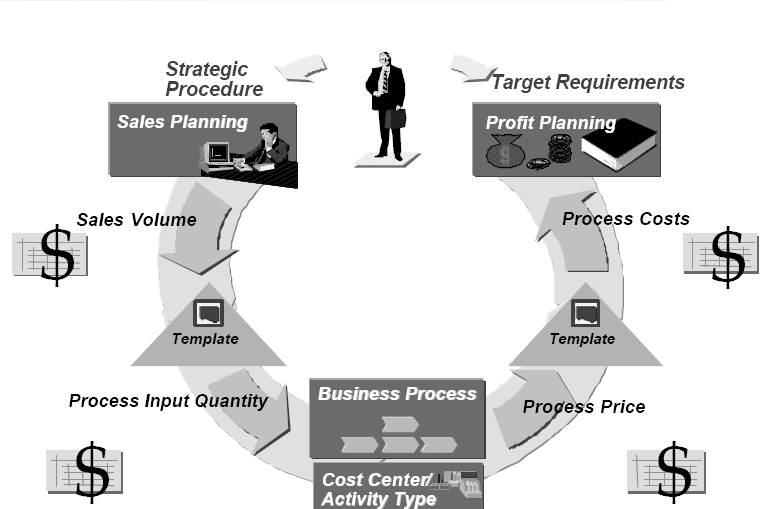 Allocations from processes to profitability segments may be done using assessment and activity allocation. These techniques have long been available in R/3 and are not new to ABC In addition to these methods, the template is a new tool for allocation. The new tool provides a more general capability than the other methods since it includes the use of formulas and functions.The use of templates results in a quantity and value flow. to CO-PA can occur.The Templates can be tied to just a few main characteristics making full use of the dynamics of the Template functions. 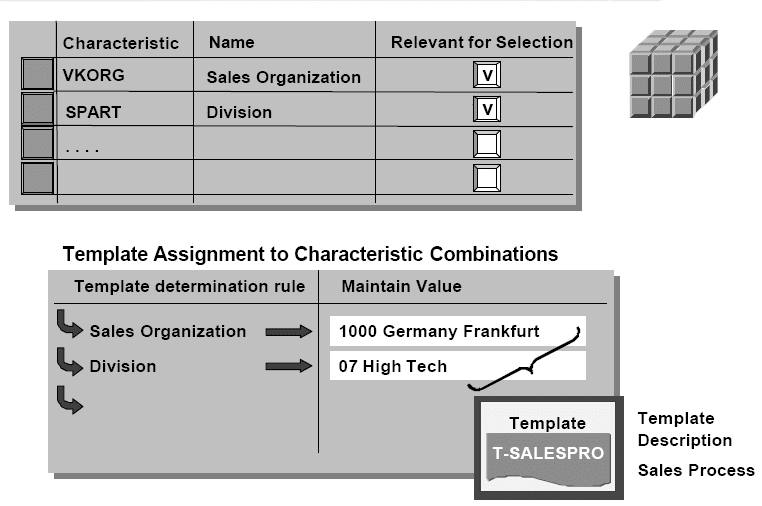 Such a Template will contain generic methods and formulas that are able to deal with many of your company’s processes in one Template. The Template can also be tied to a more detailed level of characteristics (more characteristics are used in the derivation rule). In this case the Template contains methods and formulas for processes that are specific for the profitability segments specified in the derivation rule and not relevant to other profitability segments. Cost drivers can originate from many diverse parts of the integrated R/3 system.As examples; bills of material can provide the number of components in a cost object, the router can provide the number of work centers through which the cost object must move.Product costing can provide the lot size of the material being produced.You may also create your own LIS library and structures to maintain the necessary transactional statistics if the delivered structures do not capture them.